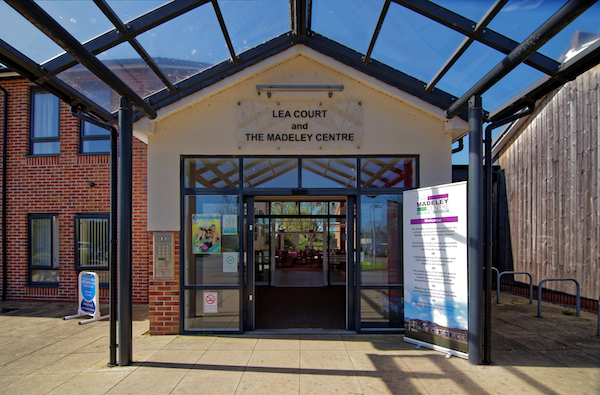 The Madeley Centre extends a warm welcome to individuals, families and groups. 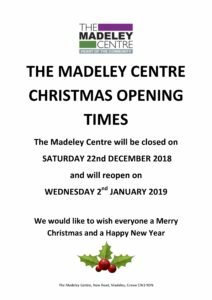 The Centre is a modern, well-equipped community centre in the heart of the rural village of Madeley in North Staffordshire. It has an eco-friendly building which uses solar panels to generate electricity and heat water. Heat-pumps draw heat from the ground to top up the heating system and rain water is harvested for use within the building. The Centre hosts a wide variety of community educational, leisure and social activities, with rooms to hire for meetings, away-days, conferences, family parties, weddings, funerals and baby naming. It has an attractive café, which is a pleasant place to meet friends for coffee or afternoon tea. Our in-house caterer offers a tasty range of food and beverages for all occasions and there is a licensed bar for functions. 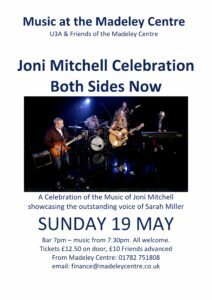 The Centre hosts regular music concerts and shows, seasonal fayres and a wide variety of other events run by local organisations. 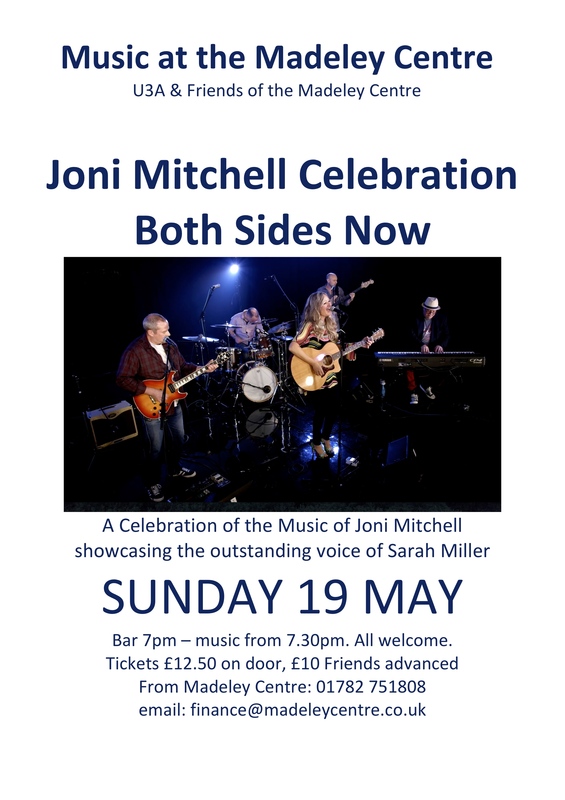 Why not come along and visit us to view the facilities? Our office is normally staffed from 10.30am to 4.00pm Monday to Friday. You can hire rooms, use the internet or enjoy something to eat or drink with your friends in the Café. The site is managed by a fantastic team of dedicated volunteers who help with the day-day running of the Centre. Our “New2U” Charity shop raises funds for the Centre. 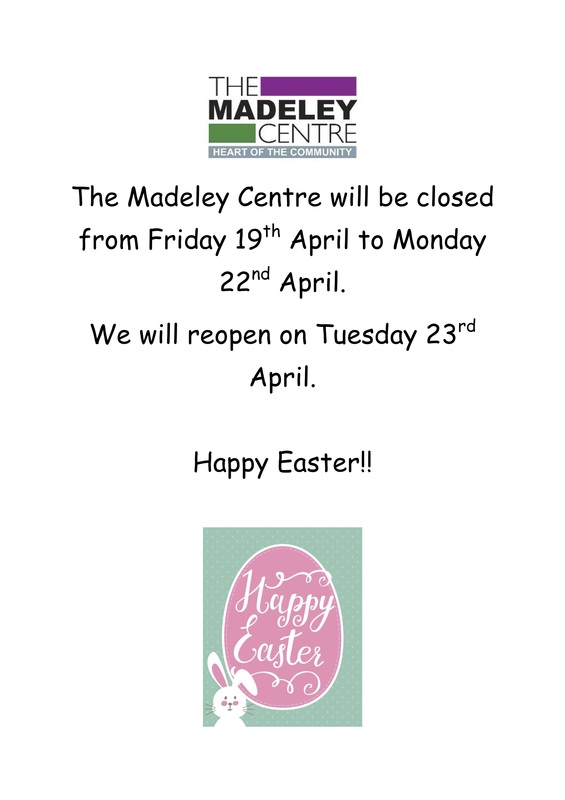 It is open from 10am-1pm on Monday and 10am-4pm on Tuesday, Wednesday and Thursday. 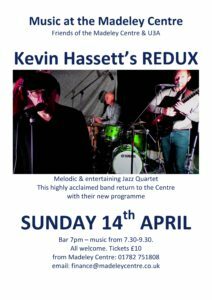 It also opens from 11am-2pm on the first Sunday of the month to coincide with our Car Boot Sales. Besides all the activities arranged by local groups, there are public events such as dance, music and theatre performances and enjoyable social functions. The local police are based in the Centre. 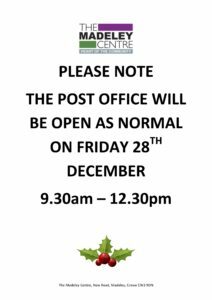 The Post Office is open Tuesdays and Fridays from 9.30 to 12.30 in the bar area of the Centre. 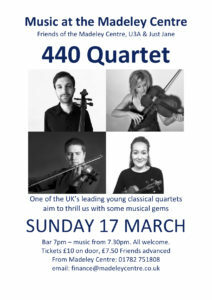 Come and hear one of our best young quartets playing popular and classical music favourites. 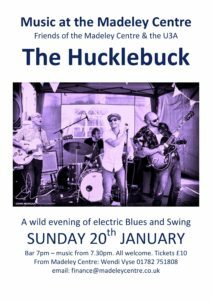 TICKETS £10 on the door. 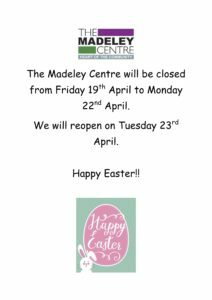 £7.50 for advanced purchases by Friends of the Madeley Centre. 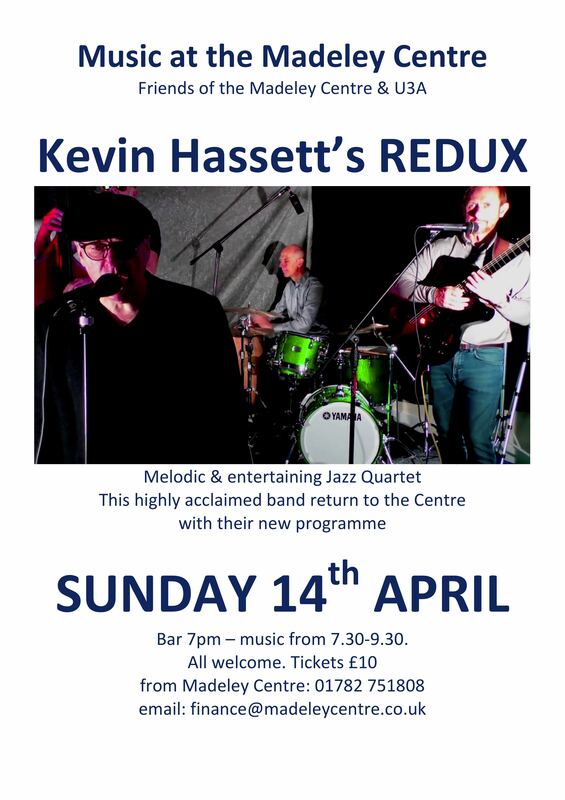 Bar opens 7pm. 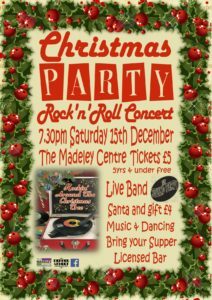 We are expecting a sell-out for our next Music at the Madeley Centre event so buy your tickets early. Irish Stew and Soda Bread for £4 can be ordered on arrival. 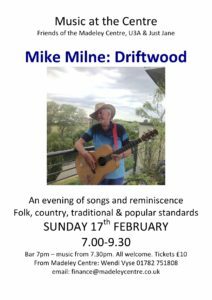 Please also bring a candle in a bottle for your table (with a match). Star prizes in our Christmas raffle. 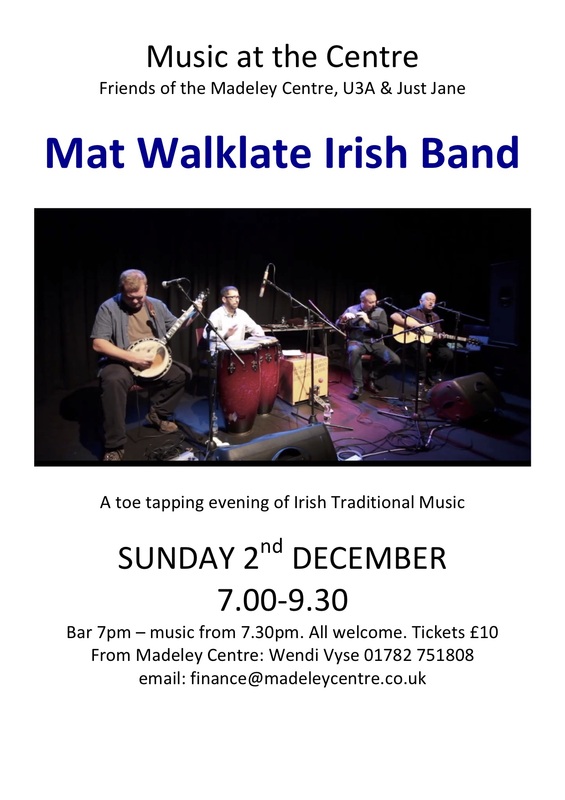 We have a lively evening of Irish Music by Mat Walklate’s accomplished Irish Band. 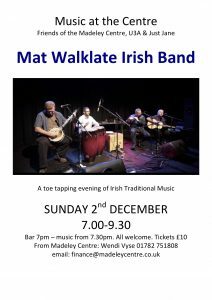 Ticket are £10 on the door, buy 3 and get the 4th free, (or £7.50 to Friends of the Madeley Centre who pre-book or reserve by emailing Wendi Vyse finance@madeleycentre.co.uk.) You can join Friends by emailing Wendi.